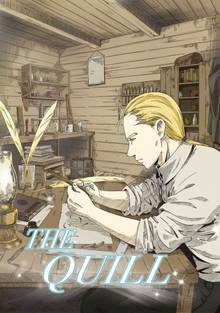 [Free Books] The Quill｜MANGA.CLUB｜Read Free Official Manga Online! The Quill is a short manga about Bero, a mysterious gentleman blessed with Quill-crafting skill and Sherry, a woman with shabby life who is always pessimistic. Set in the Old West, the romantic tale around the golden Quill invites us to dance along with the nostalgic drama, leaving a trail of tears after. This is a great story. Please tell me that’s not the end? Very nice and heartwarming story. Bero is a man every woman needs. This guy gets a new level of respect from me, going all the way to make a fully colored 50-pager with a compelling story like this. Bero has still got some secrets he hasn't shared yet. I hope that whoever he was aiming to meet up with, that he will reach there one day.